When it comes to content marketing, have you been slow getting out of the starting gate? Or are you struggling to keep up with larger competitors that crank out tons of content? It’s not an enviable position, but all is not lost. You’re still in the race—if you take the right approach and focus on your content marketing goals. Despite your instinct to knock out blog post after blog post to catch up, adopting a goal-focused content strategy will provide greater dividends in both the short and long terms. If this sounds obvious, it’s actually the zag to the zig of most marketers. Some 70 percent of them lack a consistent or integrated content strategy, according to Altimeter. Part of this no-strategy approach likely involves failing to focus on producing a single business goal with each piece of content. Some content managers won’t consider a goal at all when developing a blog post, white paper, or webinar, while others will try to shoot the moon. Both tend to produce an ROI of roughly zilch. 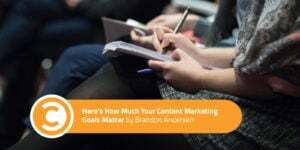 Though your overarching content strategy will likely have multiple content goals (awareness, lead generation, customer retention, engagement, etc. ), each piece of content should focus on a single one. A campaign enables brands to build upon the successes of individual pieces of content to move their audience to conversion. For example, a blog post may lead to a newsletter sign up, which leads to downloading an ebook, which leads to requesting information from a sales representative. That’s an overly simplified roadmap, but it illustrates how you can use content to create a customized and efficient pathway for your target audience. Define a goal for each piece of content. Select a specific audience that makes sense for that goal. Identify the content topics/mediums that will move that audience to the desired outcome. Analyze the results, adjust and/or expand. Remember, each step should lead to the next. For example, identifying the objective and audience helps you hone your content types (blog posts, white papers, etc.) and topics, enabling you to deliver the right message at the right time with greater frequency. Though the steps are simple, you and your team should write down your conclusions—formally, not on a dinner napkin. The extra effort pays off. According to the Content Marketing Institute, 60 percent of marketers do not formally document their objectives, audience, or goals. That diminishes their chances for success, according to a study by Dominican University’s Gail Matthews which showed that people who write down goals, review them, and share them are 33 percent more successful than those who don’t. When preparing content, remember that competition is fierce for your target audience’s attention; they are the metaphorical belle of the content marketing ball, and many brands want a dance. Identifying and creating content around the specific needs of your target audience will attract their attention, and a strong call to action for the one next step (whether it’s to purchase, learn more, subscribe to your newsletter, or something else) is the final touch. So what does this look like? Michael Smart did a masterful job with a piece of content that he posted to his blog and also distributed via email. Objective: Get registrations for his upcoming marketing seminar. Audience: Communications managers and executives looking to advance their career. Resonating Content: How do you pique the interest of high-level communicators? Appeal to their skepticism. Michael wrote about an attendee at a conference who doubted he could provide new insights. He challenged her to stay. She did. She succeeded. Then he challenged his readers to sign up for the seminar’s last nine remaining seats. Analyze and Adjust: Without speaking to him personally (and if you’re reading this Michael, give us a call some time! ), it’s impossible to say with certainty that he analyzed results. However, Michael is a savvy PR professional and marketer who has dedicated enormous time and effort to creating content and building his newsletter list. He deserves the benefit of the doubt. Xerox wanted to engage with senior-level executives but found they often couldn’t get past those executives’ administrators who triaged calls and removed marketing materials from snail mail piles. This, of course, impacted Xerox’s sales, so they found a different path. To increase sales leads (Objective), Xerox created engaging content for C-suite prospects (Audience) that wouldn’t get earmarked as a solicitation by the admins. This involved reshaping the focus of its content marketing. Rather than continuing to focus on client problems, Xerox shared how clients solved those problems and the mindset that drove their success through a collaboration with Forbes on a publication called Chief Optimist magazine (Content). The company creates five editions of the magazine that cater to specific industries and will send customized print versions to key prospects. It promoted the publications through email and printed cards that sales reps delivered personally. It didn’t take long for the results to pile up. Email readership leaped 300 to 400 percent. The company gathered 20,000 new contacts and set up more than 1,000 appointments for its sales people. The result: More than $1 billion in pipeline revenue with a 12- to 18-month sales cycle. To keep customers returning to the site, it launched online forums headed by business celebrities such as Bill Taylor, co-founder of Fast Company (Analyze and Adjust). SunGard had a challenge that so many brands can relate to: a product or service that doesn’t stoke people’s interest. However, they became a buzzed about brand in the crowded B2B technology space (Objective) by capitalizing on our fascination with zombies. SunGard focused specifically on reaching IT executives (Audience) with an infographic and ebook that showed the importance of having a resilient business infrastructure, in this case one that could survive a zombie apocalypse (Content). The infographic took the audience step by step through the procedures used to protect data and applications in the event of a zombie attack. To disseminate its gory graphic and the corresponding ebook, SunGard initiated two email campaigns: one broad-based to IT executives with titles director and above for companies earning more than $50 million annually, and another to IT executives who hadn’t responded to a SunGard email in six months. What made this zombie infographic extra killer? The call to action. Recipients clicked through to a landing page where they could enter to win a physical zombie survival kit. As the campaign took off, SunGard monitored how many times the infographic was shared by influential third-party cloud-based sites (Analyze and Adjust). The brilliance of this campaign comes from its use of zombies. Had they intended to connect with prospects only a step or two from making a purchase, zombies and a survival kit likely wouldn’t have moved the needle. When considering whether to invest in one solution or another, people tend to want cold, hard facts and case studies. However, for brand awareness, SunGard’s decision to capitalize on the zombie trend more than did the trick. SunGard’s zombie campaign produced astounding results, tripling expected downloads and doubling expected click-through rates. Additionally, several niche cloud websites featured the infographic on their home pages. Following this success, SunGard adjusted the program, initiating a direct mail-campaign and then a social media campaign. The accomplishments of Michael Smart, Xerox, and SunGard flow directly from their well thought-out approaches. Success doesn’t have to be predicated on a long history of content production. Content marketing come-latelys can enter this saturated arena and drive results. The key is being strategic and focused on a single goal.